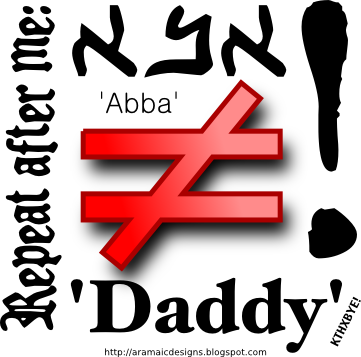 Abba does not mean “daddy,” okay? Being raised in a formal, liturgical church, I’ve always been uncomfortable with the current fad of calling God “Daddy.” In fact, I cringe every time I hear it. I used to think this was my own issue, but as it turns out, I have been right to cringe because “abba” does not mean “daddy!” I cringed because I always cringe when adults talk baby-talk. As Steve Caruso explains, the abba-daddy myth began in the early 1900’s when one guy you’ve never heard of suggested the “daddy” meaning. He didn’t base his thinking on real scholarship, but based on a hunch about how children learn language (which was wrong, incidentally). He (Joachim Jeremias) also admitted that “abba” was an Aramaic term of respect for older, wise men. Somehow, someone who thought this analysis fit their own privatized, experiential version of Christianity started spreading the myth around, and now it’s believed by millions of people who are led to believe they must share this gushy kind of sentimentality or be emotionally challenged. It’s okay to refer to God as “Our Father.” As Paul wrote, “When I was a child, I spoke like a child…” (1 Cor 13:11). I don’t know how long I can go on cringing—the next time I hear someone refer to God as “daddy,” I may scream. Just so you know. This entry was posted on Friday, June 3rd, 2011 at 11:01 amand is filed under . You can follow any responses to this entry through the RSS 2.0 feed. You can leave a response, or trackback from your own site. I never called my earthly father, father. I always called him daddy. It was and is a term of respect and honor used by a daughter who loves him tremendously. I certainly wouldn’t call any other earthly man daddy. My children called him papa. I’ve called my heavenly Father Daddy and Papa. I’ve never thought of myself as especially immature or disrespectful to either my earthly father or my heavenly one. I’m fairly confident He doesn’t either. Sorry I make you cringe. As “Abba” is a term of respect, “Abba, Father” indicates that even the Holy Spirit doesn’t call the Father “daddy.” Glad you pointed that out! But now you raise another question. Does the spirit in us that cries “Abba, Father” speak baby talk? Sorry for the confusion. No, my reference to 1 Cor 13:11 was to apply to the whole statement. As you know, Paul goes on to say “… but when I became a man, I gave up childish things.” In other words, “abba” is supposedly baby-talk, “Our Father” is speaking like an adult. Thanks for pointing that out. Sometimes I presume people will understand my occasionally vague inferences. While I don’t take exception to your main point, I am somewhat confused as to the meaning of your 2nd to last paragraph. It could be read to mean that while it’s ok to call God “Our Father” this is a sign of our spiritual immaturity or childishness. It’s the choice to quote (1 Cor 13:11) there that leads to that impression. Is that what you are in fact trying to say? Oh yeah, I forgot about that one. I agree. Maybe God’s okay with it, but it just seems weird to me. “Papa” is the one that gets me. I never called my dad “papa” and would never refer to God that way either. When I talk to God I prefer “Sir” or “That Guy Up There Whom I Can’t See.” They seem to work okay, though, since God rarely gets back to me, I wouldn’t stake my eternal security on that.